So I decided to give Fujifilm some more of my money and picked up a brand-new XF100-400 f4.5-5.6 R LM OIS WR Fujinon lens. That is a long name! Well, it is a long lens as well; actually the longest focal length lens available right now and probably for quite a while. Without boring you with more technical details (click here for my review), this is the lens I've been waiting for, for quite a while. It will be used in my Aviation Photography as well as, yes surprise, surprise... landscape work! I love to zoom in close on distance objects and use the compression effect of a long focal length to my advantage. The first shot I took with the new lens was of one of the most famous landmarks in Dubai; the "7-star Burj al Arab hotel". I knew beforehand where the full moon would rise and used PhotoPills on my iPhone to determine the perfect place to stand on the Palm Jumeirah. Unfortunately, there was a strong haze layer on the eastern horizon, leading to the moon only being visible about 15-20' minutes after moonrise. 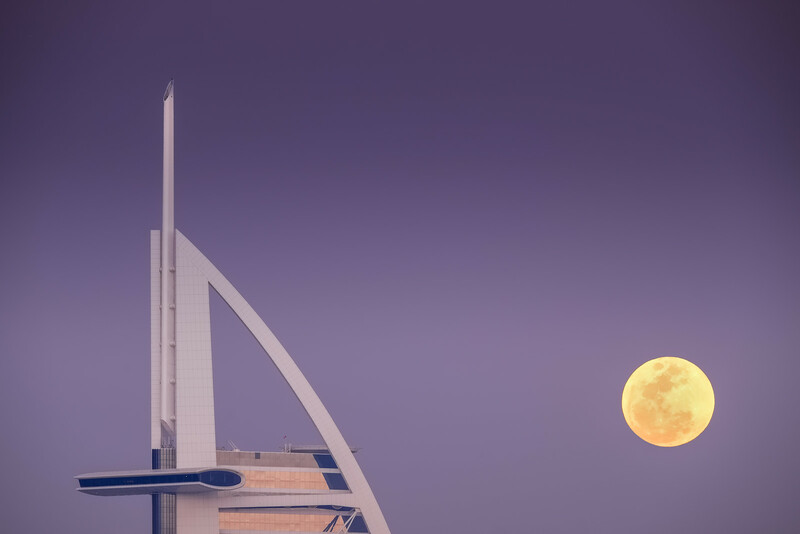 For me the moonrise over the Burl al Arab is a continuous work in progress; slow progress that is, since there is only one day one can shoot this scene. The night when the moon turns 100% and when it rises about the same time as the sunset time. Other days the contrast with the bright moon and dark foreground, makes it impossible to photograph in one single frame. One then also has to be lucky with the weather as well as not having other work/family commitments! Yes, dedication in photography is shooting on the night of your birthday! I do have a few other ideas of positioning the moon, but will have to wait till the next moon cycle... Patience in photography pays off! I would like the highlight that the image is single frame (no HDR or image blending); no photoshopping of the moon in the perfect place. To me, it is all about the perfect moment! As stated in my lens 100-400 review, I'm very impressed with the sharpness of this long focal length lens; this image clearly illustrates it once again! To me, the above image deserves to be part of my Architectural portfolio, which can be found here. For those long time blog readers that do have a "Déjà vue", I did indeed shoot a similar image at a wider 200mm focal length just over 2 years ago; called "Moonrise over Dubai". More Architectural images from Dubai live here. Aerial photography, has always been one of favourite genres of photography. While I generally shoot this from an aircraft, occasionally one can do some interesting Aerial photography from a high-rise building as well. Such was the case mid-January, when I was up on the Tokyo Skytree; an observatory and broadcasting tower in the Sumida district. 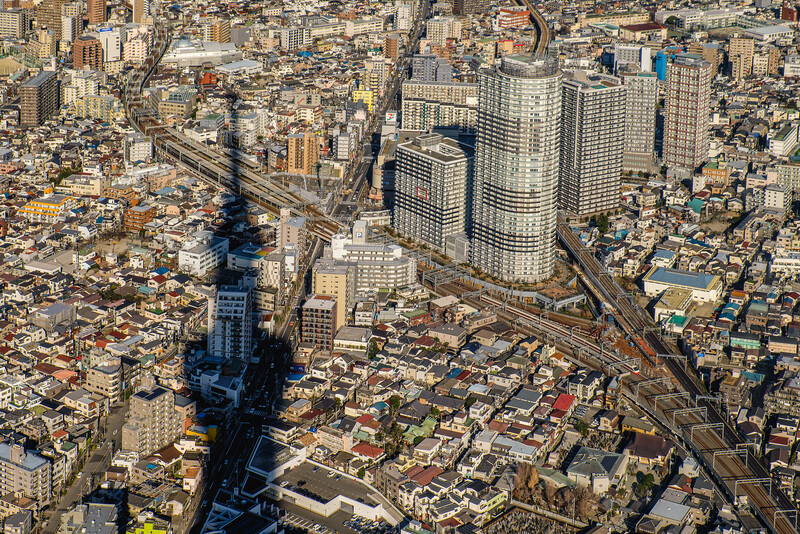 With its 634m, the Skytree is the Worlds second largest tower, after the Burj Khalifa (829m) in Dubai. Even though there are no open spaces like on the Burj Khalifa observation decks, the space is very well thought off with sloping glass surfaces that pretty much completely eliminate reflections. I was especially attracted by the shadow of the tower that was projected on the city below. My complete Aerial Photography collection can be found here. Over the years, a weekly ski-trip to Europe in February has become a must. This year, I spend 7 days in the Skicircus Saalbach, a resort consisting of four villages in Austria Tirol (Saalbach-Hinterglemm-Leogang-Fieberbrunn), with a combined 270km of ski-slopes; the largest resort in Austria. It was the third time, we stayed in Forsthofalm; an amazing welness hotel right on the slopes (not in the valley), that over the years has seen a lot of expansion. The hotel is built entirely out of wood around a small chalet (visible in the middle) dating back to the 19th century. Just like every ski-holiday, I have to take at least one camera with me; this time it turned out to be the Fujifilm X-T10 with the 27mm pancake, 35mm f2, and 18-55mm. While skiing, I carry the X-T10 with the 27mm, which turns out about the same size as a X-100S or T; perfect to capture those great moments while on the snow. The duo fits quite nicely into my Peak Design Field Pouch, which I strap to be my belt. 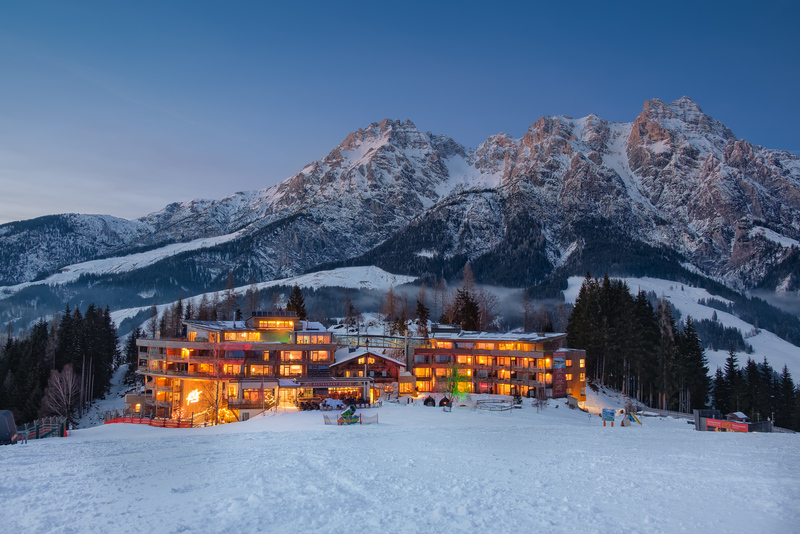 The image below was shot during the blue hour, on the ski-slope directly in front of the hotel, using a Gorilla-pod mini-tripod. While blue hour is typically about 20-40 min past sunset, in the mountains it is often much closer to sunset, as the sun disappears much earlier behind one of the mountains peaks. The mountain range in the background is the "Leoganger Steinberge". A few weeks ago, I spend some time in Tokyo for the 5th anniversary of the Fujifilm X-series. In case you missed it, a blogpost about the event can be found here. Even though it was not a full on photography trip, we still managed to go out and shoot the streets of Tokyo whenever some free time was available. Such was the case on the day we ended up in "Ginza", Tokyo's most famous upmarket shopping, dining and entertainment district. Ginza is great for street photography any day of the week, but on the weekend afternoons, it gets even better, as the main street, Chuo Dori, becomes a large car-free pedestrian zone. 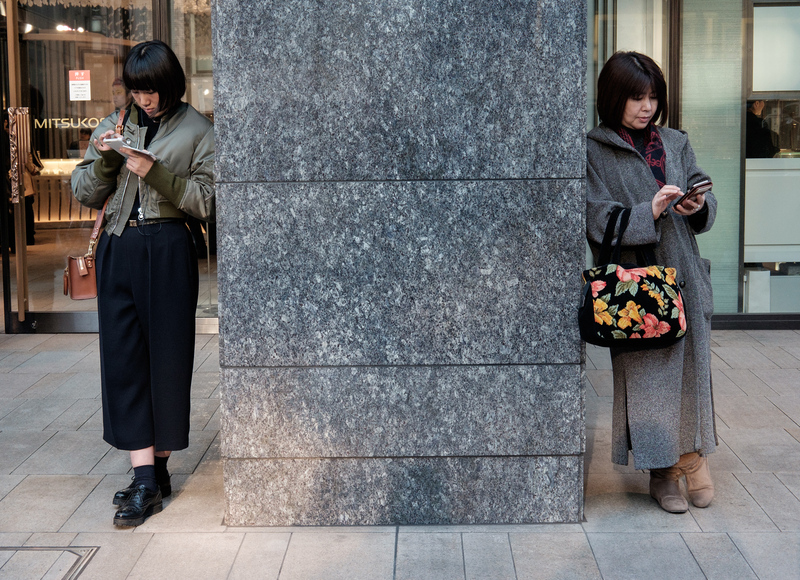 The image below was shot just outside one of the famous department stores, Mitsukoshi; where two ladies were standing on opposite ends, checking their phones. I was attracted to the scene, because they somehow looked like being related; mother and daughter? I owe it to the tilt screen on the X-T1 that this image could be made so easily. A low perspective without being noticed while filling the frame; hard to do without. I still regret not having a tilt screen on the new X-Pro2! The complete gallery with all of my Tokyo images can be found here. Remember, "If you photos are not good enough, you are not close enough" - Robert Capa. 27 January 2016, 03:05 - Wide awake after barely three hours sleep. Where am I ? San Francisco. Yes, now I remember again. I have flown in here yesterday after a 15hr 30' flight from Dubai. The 12hr time change is killing me. At least there is no need to change my watch; 0305am or 0305pm, it might look the same, but my body definitively thinks differently! The first thing I see when I open my eyes, is a camera on the nightstand; it looks like an X-100, but it is smaller and doesn't seem to have a viewfinder; it says Fujifilm X70 on the top! 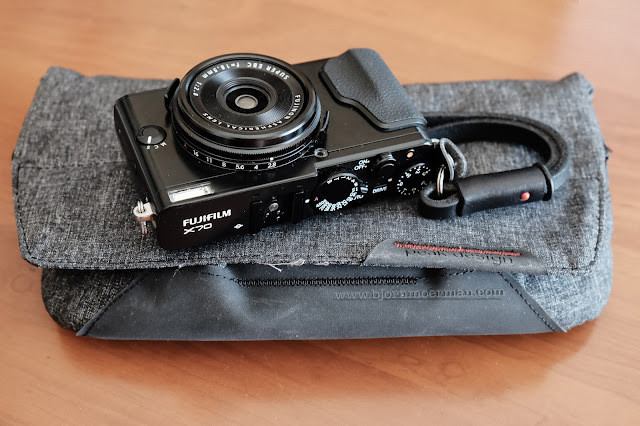 This new addition to the Fujifim line of fixed lens cameras was launched during the 5th anniversary of the X-series in Tokyo earlier this month (see post here). One of the first questions I ask myself is where the 70 in X70, is coming from : 70% smaller? 70% less functionality? 70% cheaper? I'm about to discover it. Stamped with a sample icon at the bottom, I brought this pre-production copy on my 48hr layover here in Northern California. A small camera with no viewfinder and a fancy 3 inch touch tilt-screen! I'm sceptical; maybe I should have brought my X-T1! It is still pitch dark outside, but I want to try this little newbie now. 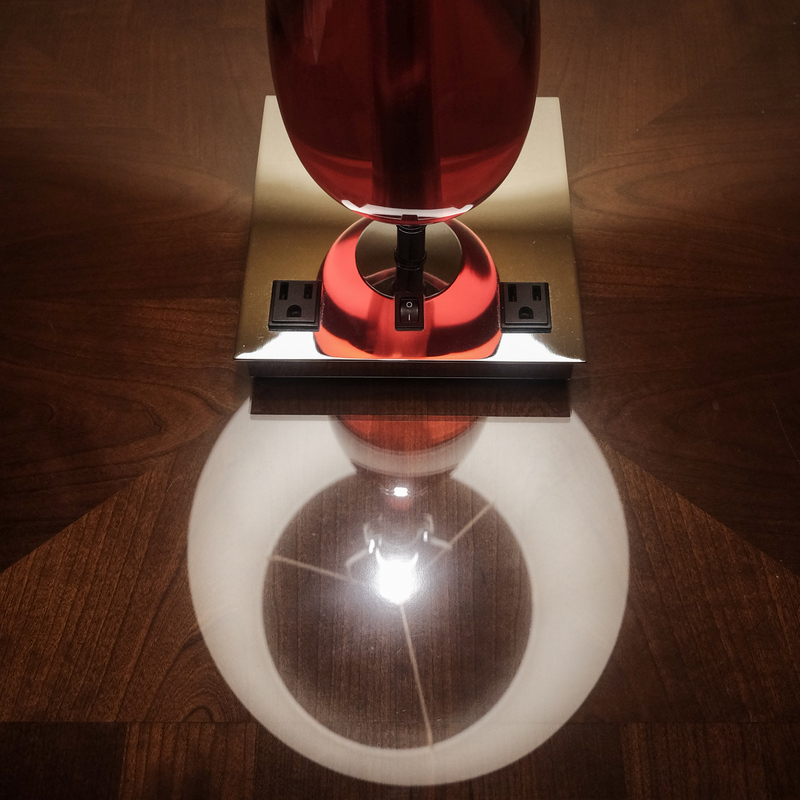 The reflection of the bedside lamp on the nightstand intrigues me. I know the high ISO should not be a problem for the X-Trans II sensor; after all I've shot the same sensor on the X-T1 for over a year now. Even though, the menu looks very familiar for X-100 and X-T1/T10 users, there are a still few things that I'm not to 100% sure about... I look online for an X70 manual but Google brings me no joy; even though their head-office is barely 30km away! I guess, I'll have to wait till later in February when the camera becomes available to all photographers. Post publication: The Fujifilm X70 manual is now online here. Still on the Menu system, I can't see why Fujifilm did not update the X70 to the much better Menu system of the X-Pro2 (my review here); after all they were announced the same day! Shooting street photography with the 18mm (28mm full frame equivalent) lens makes me nervous, as I'm so used to shooting the streets at either 35 or 50mm. Maybe this is the reason I am wide awake at 3 in the morning? I start looking for some "Street" images shot at 28mm and end up with photography legend, William Eggleston. 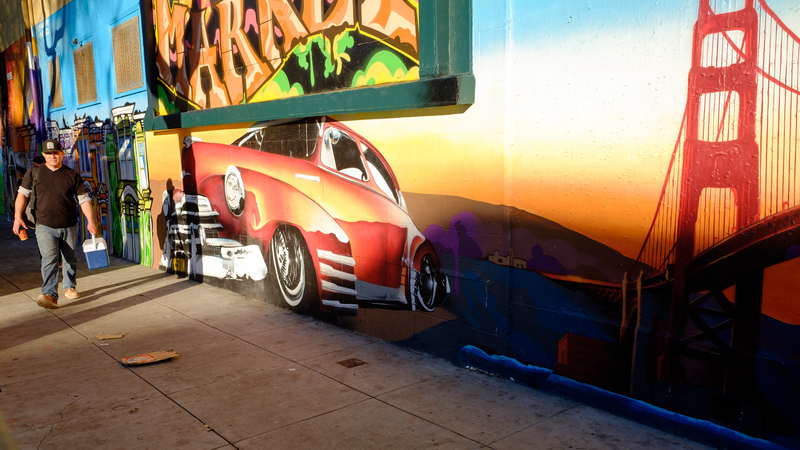 Known for using a 28mm lens on his Leica's he is one of the masters of Street photography. 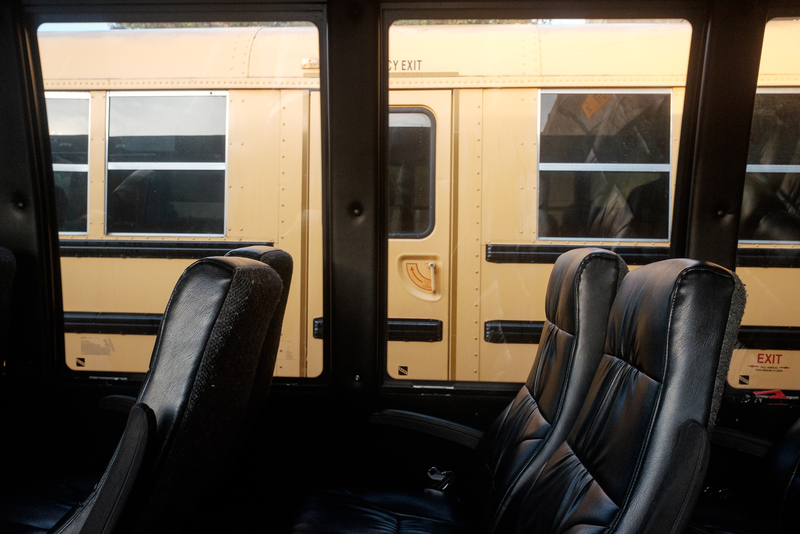 Eggleston's color work is inspirational and reminds me of Fujifilm's Classic Chrome Film simulation. Today is going to be a Classic Chrome day in honour of a great 28mm photographer! Just before five, I fall asleep again. But that comes too late as only two hours later my alarm goes off; it hurts! I need coffee. 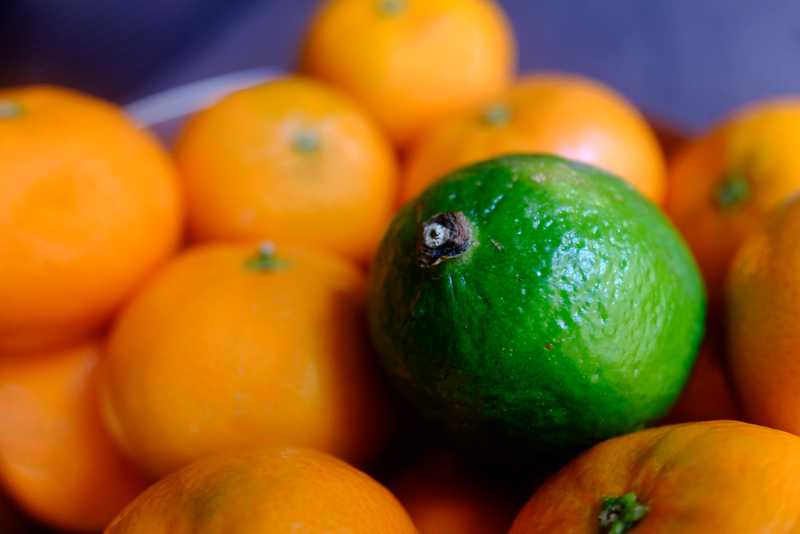 While I'm waiting to be seated at breakfast, I try the minimum focus distance of 10cm (4inch) on some Californian Mandarins. Looking at the image at the back of the display, I start day dreaming; "Dare to be different", flashes through my mind. Companies like Fujifilm have really changed the camera market with the mirrorless revolution. 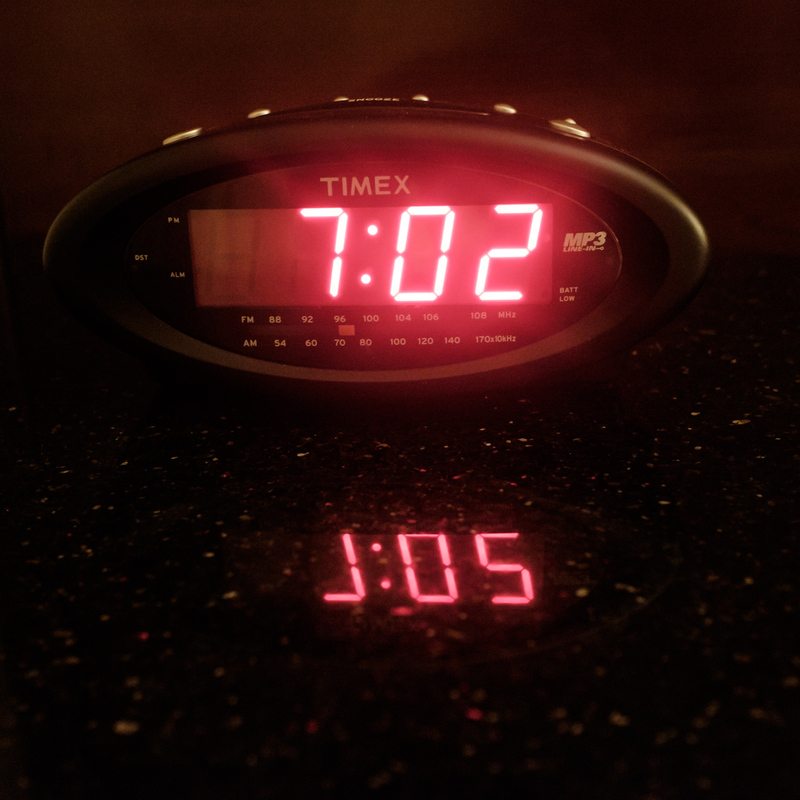 Canon and Nikon, it is time to wake up, or do you suffer from jet-lag as well? A quick check during breakfast if anybody else has written fresh blogposts about the X-70? Nope. I browse through Jonas Rask's review to refresh my mind about this strange little camera! Jonas his review is the most comprehensive review I've found so far. There is an email waiting in my inbox from Adobe; they just released a new version of Lightroom and Photoshop that now supports the X-Pro2 and X70 ... I guess I better shoot RAW+jpeg today! 07:50, Oops, time to go. The hotel shuttle bus for the SFO airport, is leaving in 10 min. I grab the X70 and put it in my little PeakDesign Field Pouch, attached to me belt. It feels weird to leave for a full day of shooting without having some kind of a camera bag. Anyway, my plan is to catch a train to downtown San Fran in SFO. Luckily nobody will ask why this crazy photographer is shooting empty bus seats on the way to SFO, as I'm the only passenger! Occasionally I catch myself bringing the camera to my eye; I feel stupid as the X70 doesn't have a viewfinder! Is this thing really useable or is it a toy? After figuring out how to pay for the train ticket, I'm ready to board the BART (Bay Area Rapid Transit). 09:00, Chinatown, one of the largest Chinese communities in the US; turns out perfect as a first test for 28mm classic street photography! I'm keen to try the new 3 inch touchscreen while this part of the city is waking up. During my sleepless night, I figured out that the X70 touchscreen has three options; off - focus - shoot. 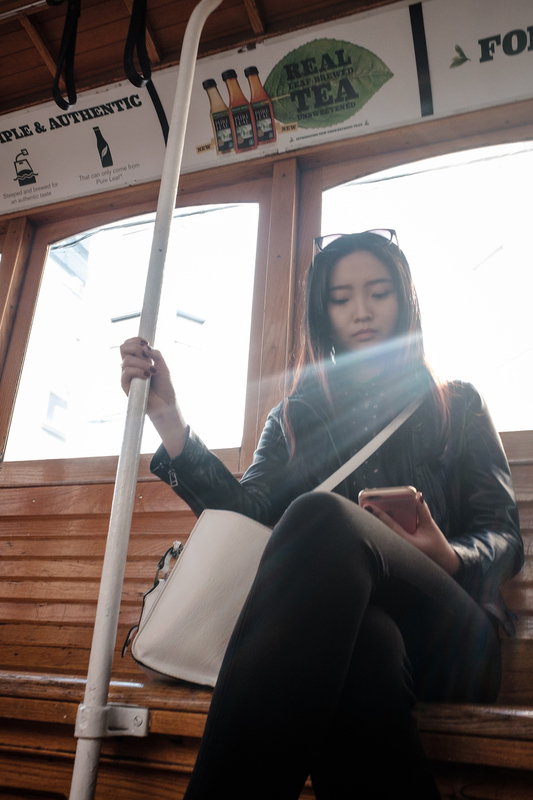 The "shoot" option seems to be targeted to the younger generation of smartphone shooters which are so used to taking an image by tapping on the screen. Not something that feels natural to me on a "real camera", but maybe I'm just old fashioned! I start getting some good images using the "shoot" option on the touch-screen, but sometimes it still seems to be a bit of hit and miss. It feels there is definitively more shutter delay than when using the shutter button. 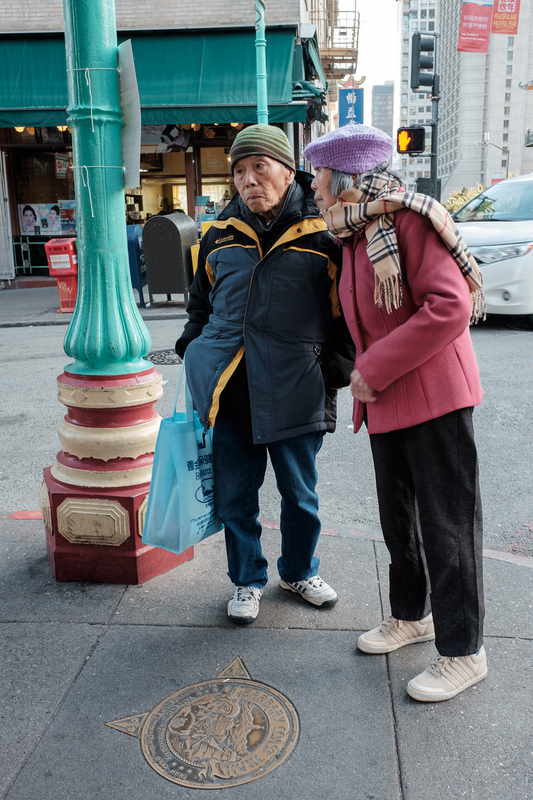 Luckily this older Chinese couple stood relatively still. 10:15, Shooting birds with only a 28mm equivalent focal length; are you mad? 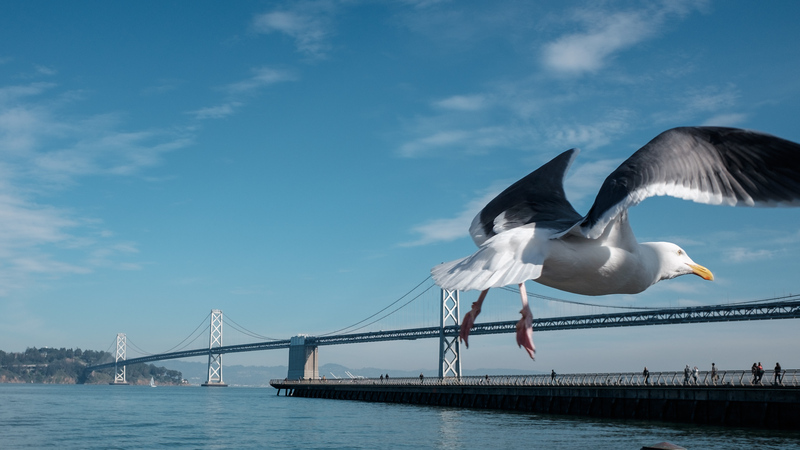 Given the X70 has pretty much the same autofocus functionality as my beloved X-T10 and X-T1, I wanted to try it on some of seagulls flying around. And yes, it seems to work! The lens takes a little time before is locks the focus and is not entirely silent as the auto-focus does its job but does an overall good job. It kind of reminds me of using the 27mm pancake lens on the X-T1/T10; very similar in autofocus performance. 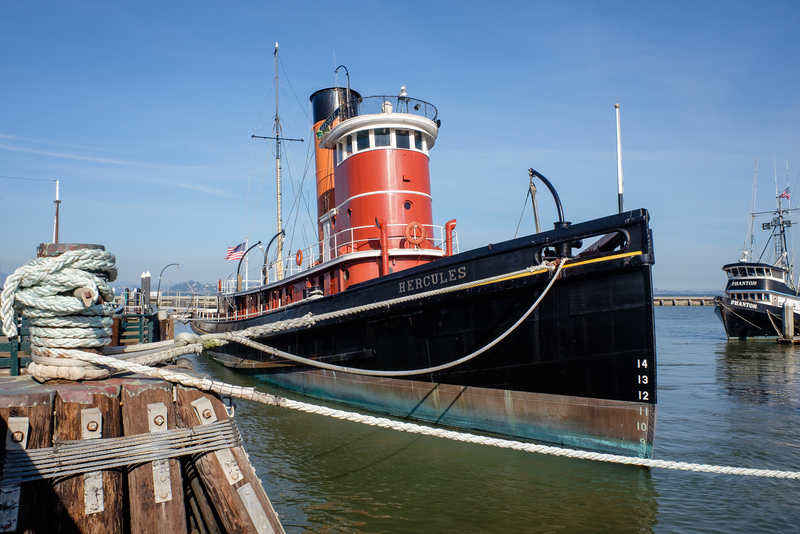 10:50, On the Hyde street pier, I shoot some of the vintage boats; a good opportunity to test the overall sharpness of the lens. I'm impressed; all the way to the corners the lens remains tack-sharp, even at larger apertures. Fujifilm lens devision has obviously hired the right people! Even though today is a "colour" day, I regret that this little camera does not have the new Acros Black and White Film simulation mode; something I really enjoyed when shooting the new X-Pro 2! 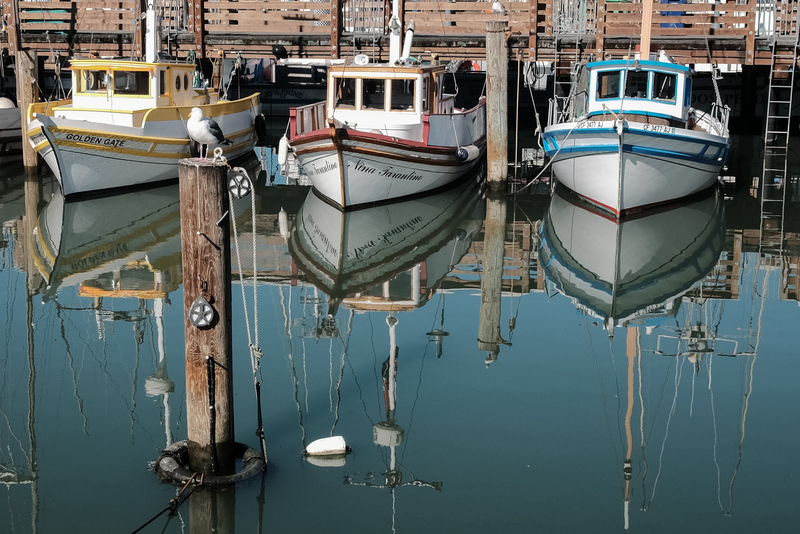 11:20, Fisherman's Wharf: I struggle to activate the new Digital Tele-converter in the menu, a function where one can digitally zoom in with the fixed lens. Digital zooms and restaurants in overly touristy places like Fishermen's Wharf; I don't thrust them! Today, I'm willing to give in on one! Luckily I manage to activate the 35mm/50mm setting, as I really don't want to fall into the Fisherman's Wharf tourist trap! Of course one needs to set the camera to jpeg only, in order to have access to the function; unlike the Ricoh GR which allows it to be done in RAW as well. The whole thing does some kind of a pixel magic (non-official technical term), while maintaining the 16Mpx file size it degrades the image quality slightly; similar to upscaling an image in Photoshop. As can be seen in the 50mm image below, it does an OK job for web usage, but I wouldn't use it for large images to be printed. 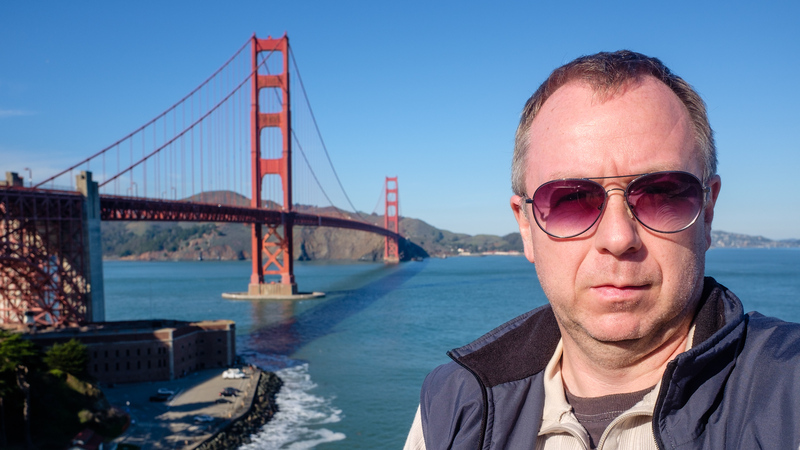 11:55, Now that Fisherman's Wharf is behind me, there are two more items I need to clear of the "I've been in San Francisco" list; let's start with the Golden Gate bridge. Apparently this camera is good for selfies; I flip the screen through 180 degrees and now feel like a real tourist! I've sworn to myself, to never do this; I've lost the battle! 12:15, My first battery is about to go dead. I've shot mirrorless cameras for a while now and will never leave the house with anything less than 3 batteries... Since everything on the X70 is done through the LCD screen, I thought battery power would suffer even more. It did however turn out to be on par with the other X-series cameras like the X-100S/T and X-T10. A big advantage compared to most of the other X-series cameras is that the X70 can be charged through a USB port or battery powerpac. 12:30, Riding a cablecar in San Francisco is my third and last one on the list. Let's just do it and be over with it. At 7,-USD it is not cheap; but my 20,-USD Muni day-pass covers it. 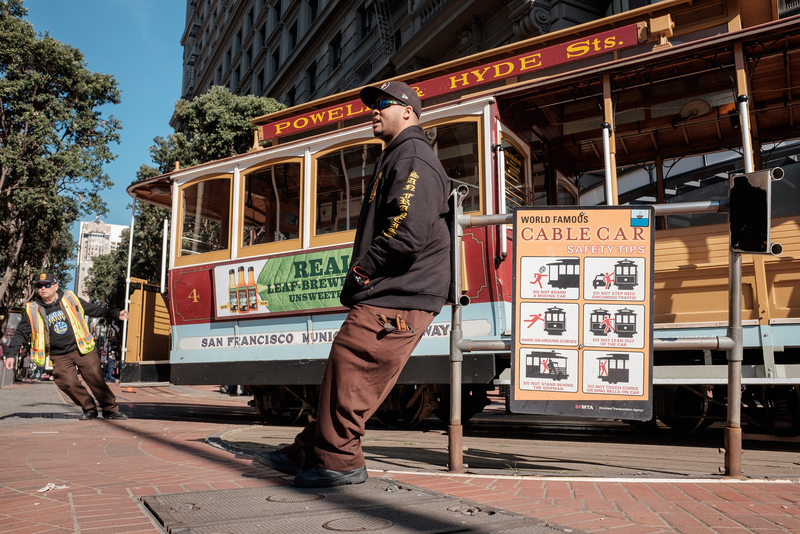 I jump on the Powell-Hyde line at the top of the hill and it's pretty much all downhill from here. The good news, is that there are hardly any tourists on it; where are they? Let's try and shoot some more candids; hmmm, I start liking this touch flip screen more and more! My secret Asian friend didn't even hear the sound of the shutter; yes, that is right the leaf shutter on the X70 is as quiet as the one of the X-100's. 13:05, My watch tells me I need to have lunch, but my body-clock doesn't agree. I end up ordering a Cheese-Steak sandwich anyway but regret having made the choice once lunch is ready! Maybe one of the restaurants at Fisherman's Wharf would have not been that bad after all. I rest a bit at Union Square and sit down next to a strangely dressed lady. She's constantly observing me, maybe she's a photographer as well? I connect my iPhone to the X70 Wireless network through the Fujifilm Camera Remote app. Pretending I do something on my phone, I frame and make the image below through my phone. Did she notice? I don't think so! I'm liking you more and more... the camera that is. 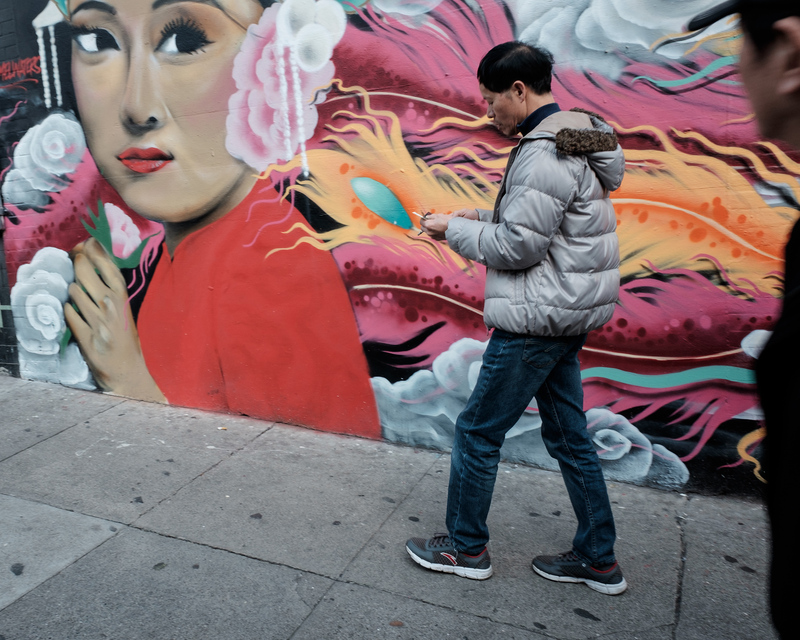 14:15, San Francisco street photographers rave about shooting at "The Mission". I jump on a bus and head South; what I thought would take about 20-30 mins turns out to be more than an hour. At least the bus ride gives me the opportunity to fiddle a bit more with my friend for the day; to be clear I mean the X-70! Lol. The built quality is really good; even if it says "Made in China", we all know it is mainly an "assembly" in China. The quality is on par with cameras like the X-Pro2, X-T1 or X-100T which all carry the "Made in Japan" label. 15:00, The street scene is changing quickly; I can see why those Street Photogs like this place so much! 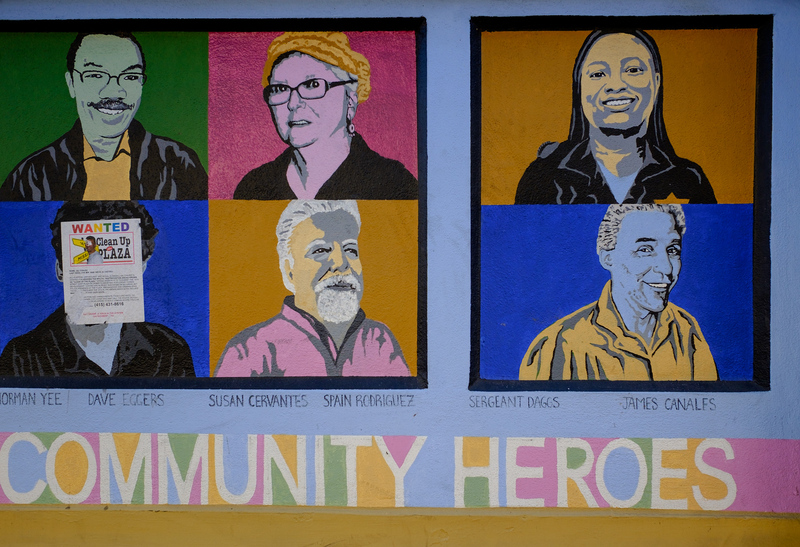 I get off on 20th Street in the Mission and walk a few more blocks down. 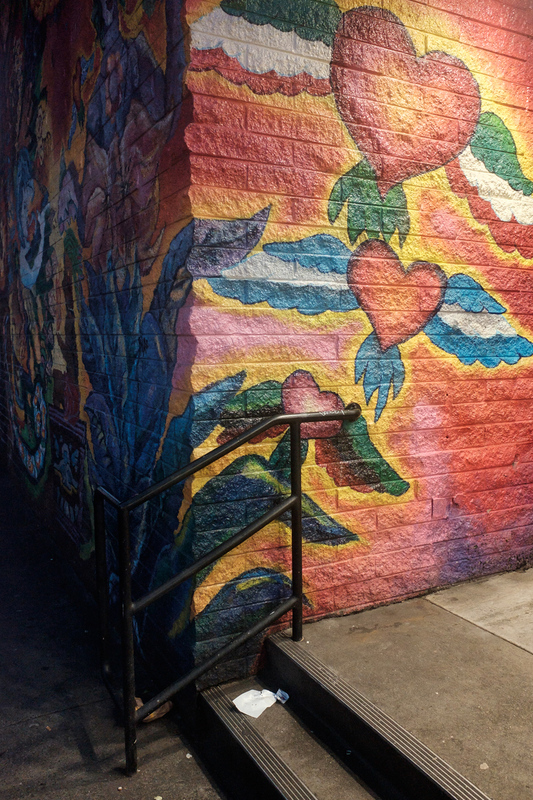 Before I know, I end up in a small alley with some great graffiti at the walls. This is a different San Francisco; some strange looking characters hang around this dead end road; the smell of weed is very much present. I'm happy not to carry an expensive DSLR around this neighbourhood, but I enjoy the experience! 16:15, I'm really start to be in my element now and the X70 feels right at home in the Mission! It feels like we are bonding well. The late afternoon light is wonderful. 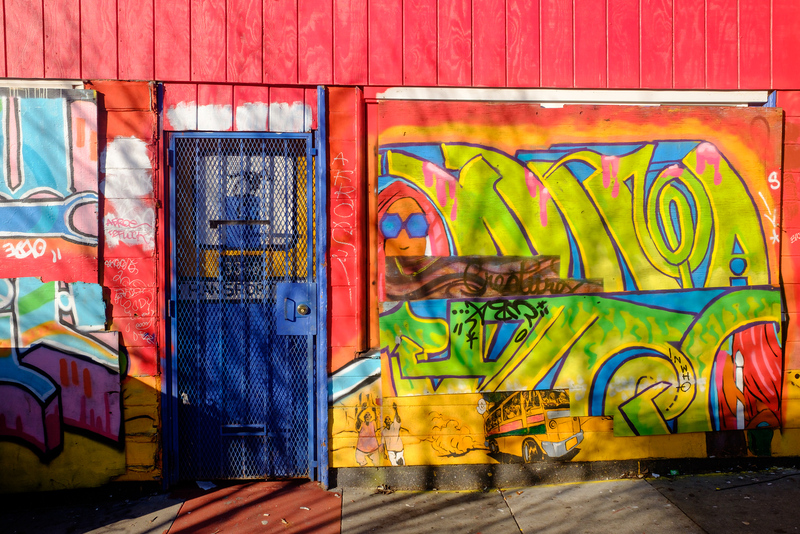 I briefly change the camera to Vivid in order to capture those amazing colours of the graffiti walls. 17:15, The sun is setting quickly now. 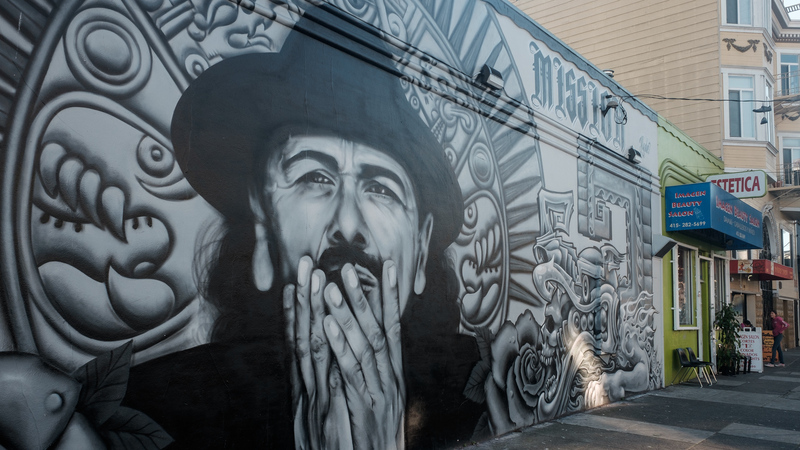 I feel good having come over to the Mission; love this place! Crisp colours and hard shadows, a dream for every street photographer. 17:45, Finally my body tells me it is hungry. It must be breakfast time back home in Dubai! I follow a few musicians into a Mexican Cantina and order a Chicken Taco and Pacifico beer for breakfast. Only now do I discover how easy it is to check focus or browse through my images with the X70; it is very much iPad like; double tap to zoom, drag one finger to check the different parts of the image or just slide to see the next image. It wasn't love at first sight with the X70, but I've really started to like it as the day progressed. I'm even asking myself how I can keep this near perfect street photography camera. Do I tell Fujifilm Middle East, I lost it? Or that I was robbed? 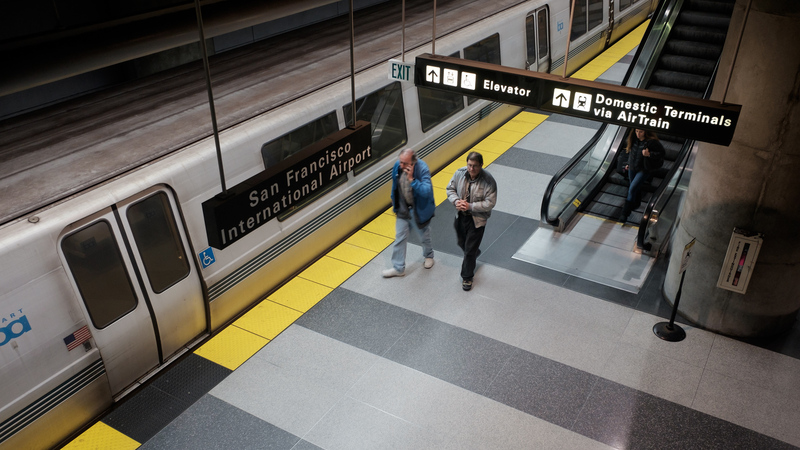 I jump on the BART and head back to SFO airport. The Asian couple next to me is about to catch a flight and fly through the night. They will discover what jet-lag is tomorrow! I hope they don't mind I made a few candid shots. 1940, Back in the San Mateo hotel, I export a few shots to my iPad using the Wireless camera function. Import into Lightroom Mobile for a few minor tweaks and we are ready to upload to one of my too many Social Networks! 20:15, Time to grab a last drink and look back on my day (or was it night?). When I first shot the X70 earlier this morning, I though this camera was a bit of a gimmick. How to make images without a viewfinder? 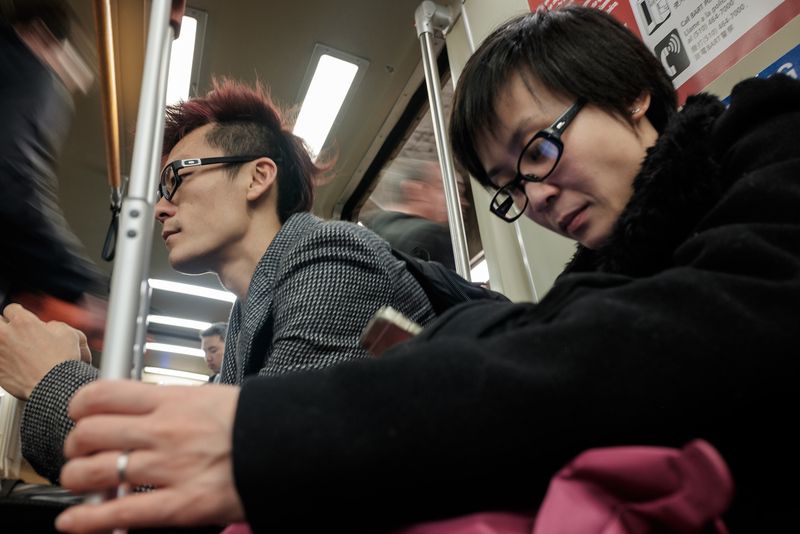 Is the 18.5mm lens useful for street photography? What is the fuss about this touchscreen? I now have an answer for all of these questions and have come to the conclusion that it is a "photographers" camera and not specifically aimed at the consumer market. Even though, I've never used one myself, I now understand why every street photographer is raving about the Ricoh GR; a camera that undoubtedly had a big influence on the Fujifilm designers of the X70 in Japan. At 699,-USD the price for the camera seems fair, especially given the fact that it has the same CMOS sensor as the X-100S/T and X-T1/T10; providing us with excellent image quality. The optional VF-X21 External Optical Viewfinder however, seems to be priced at 150, USD; which for a only optical device showing you a fixed rectangle, is excessive. Time to get some more rest now. Tomorrow afternoon I'll fly back to Dubai. Goodnight and sweet dreams about 28mm street photography and cameras without viewfinders! The complete gallery of all the images shot with the X70 on January 27, 2016 can be found here. Feel free to share this post on forums, social media, etc... No specific permission is needed as long as credit is given to Bjorn Moerman Photography.